You may be glad to know I’ve calmed down from my mini Big Food/Big Pharma rant of last week. I got seriously close to popping a vein. I’m just glad I didn’t think of taking my blood pressure at the time of writing. I was a bit worked up, but once my post was edited for public consumption (removal of a few ‘bloodys’ and possibly something close to libellous), I took a deep breath and just made a pizza. This pizza. Actually many pizzas, and much garlic sauce. 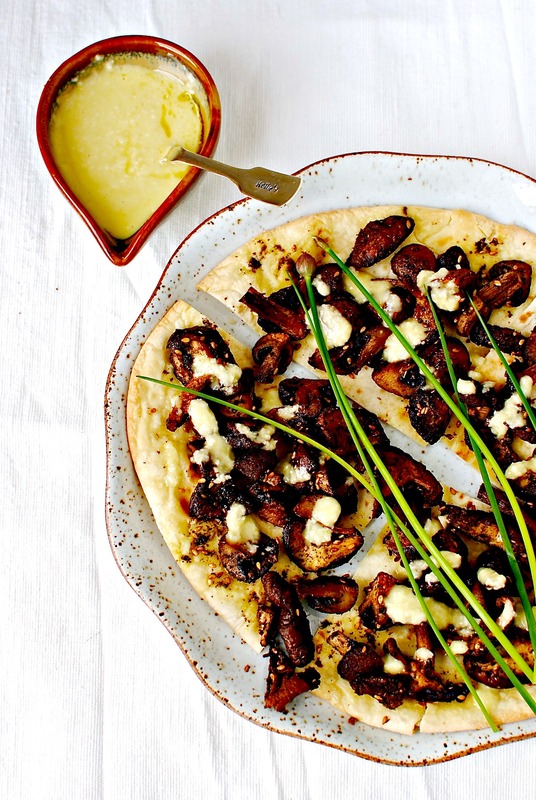 Grassy, amber olive oil and pungent, sassy garlic – whose magical properties some drug companies like to sell us in yucky, boring pill form – dolloped over equally magical mushrooms, roasted with za’atar and topped with garden chives. All on a crisped flatbread, golden-edged from yet more olive oil. Whose mood wouldn’t improve with that staring at you from a plate? Perhaps not the boss of a big pharmaceutical company, but they’ve got their fat pay checks to cheer them. My family don’t mind if I get worked up as it often results in me storming into the kitchen in an indignant rage, bashing about until something emerges from the oven. Rarely a cake. Cakes need to be made in good temper and good cheer. But pizzas, or anything requiring a lot of chopping, are perfect for indignant rage. Or not. You certainly don’t have to be in a foul mood to make pizza, but rolling dough (which you don’t have to do for this, btw) and chopping things is such a good tonic to stress and upset. Eating the result, even more so. And it seems I was treating my undoubted spike of blood pressure as well: extra virgin olive oil and garlic (especially just crushed and raw like this) are, of course, good for lowering blood pressure and improving heart health. So much more delicious and cost-effective than yet another damn pill. Do you head for the kitchen when you are stressed or upset? What do you make? Does it help? I’ve used a combination of chestnut mushrooms and shiitake mushrooms in this simple, herby recipe, but use whatever kind you have or like. Although the amount of mushrooms is up to you, please bear in mind that the mushrooms do shrink quite a bit when roasted, so don’t skimp on them. Also, you can save some calories by using oil spray on the mushrooms – they are a bit drier as a result but once you drizzle over the garlic sauce it all plumps up. One pizza will do for two as a snacky meal with salad, but you might like to make one each if you are particularly hungry or active. Btw, the garlic sauce is bloody fantastic so make more if you like and use it as a dip or drizzle for vegetables, protein – anything but dessert! 2. Mix the oil with the za’atar and toss into the chopped mushrooms. 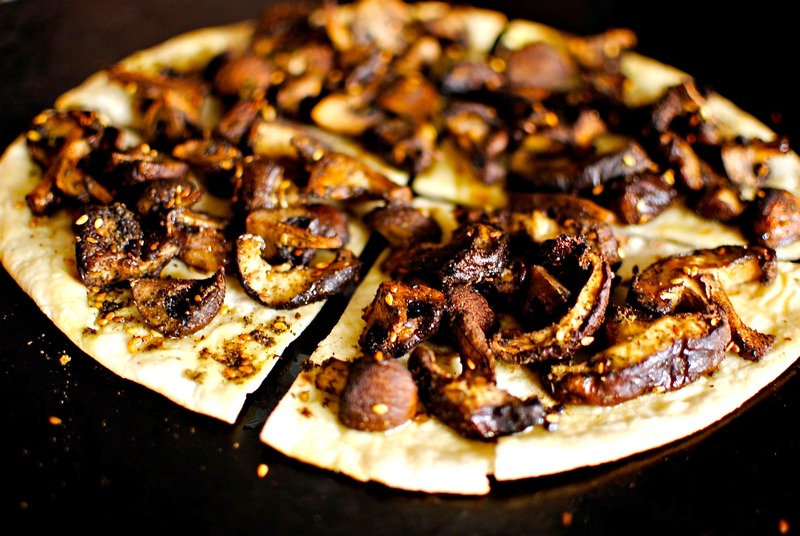 Or spray the mushrooms with oil spray and toss through the za’atar. Pour the mushrooms onto two baking trays and roast for 10 minutes. 3. While the mushrooms are roasting, gather the sauce ingredients and blend them until smooth in a mini food processor, or use a hand blender. 4. Take the flatbreads and cut them into even slices, pizza-style. 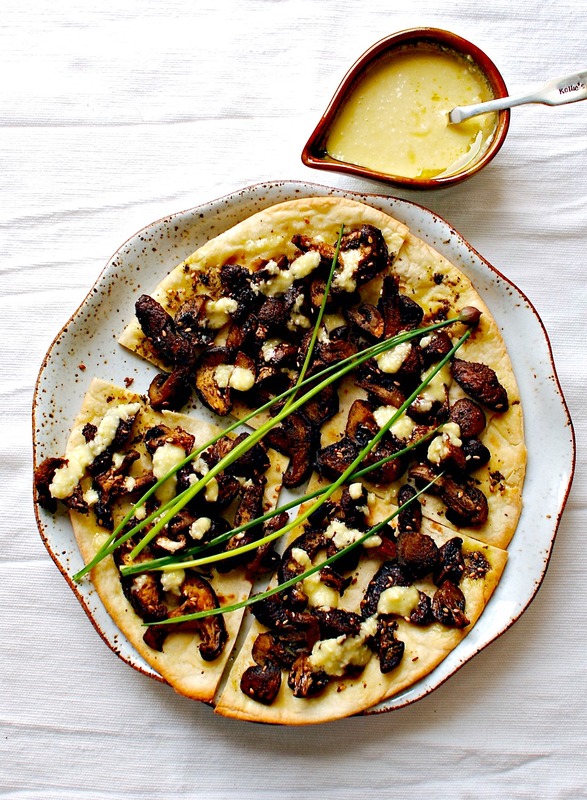 Once the mushrooms are cooked and hopefully still quite juicy, divide them among the slices, drizzle a little oil on the outer edges of the flatbread and pop the pizzas back into the oven for another 3-4 minutes, or until the bread is slightly toasted and ‘pick-upable’. Serve with scattered herbs, salad and a jug of the lemony garlic sauce. *Arabic style preferred but any soft flatbreads will do – tortillas will be too thin. Of course a recipe of homemade flatbread or pizza base would be perfect, in which case place cooked mushrooms (pre-roasted for five minutes) on the dough and bake as indicated with your flatbread/pizza recipe. Track of the week is an oldie but goodie from Scottish band OK Social Club, Gezelling. I can’t believe I haven’t posted this before as I really love it. Cheeky, sweet and honest. Love Raff’s voice so much. I know! But I think the knowledge that I have to be careful and slow things down helps calm me as well. It’s when I am in a tearing hurry getting things sorted for work (making the food) that I can come a cropper. Thank goodness for fingernails is all I can say! Yes, I would agree with that, when I’m not angry AND hurried, I feel safer. The structured, methodical focus in the kitchen is much like the focused attention we bring to the moment in meditation. And I don’t know about you, but I do much better alone in the kitchen, rather, it’s more relaxing for me that way. I find cooking very therapeutic. I remember the most anxious time of my life (while awaiting the results of a cancer scan) the only thing that worked for me was getting into the kitchen and chopping. I made a huge salad with lots of great stuff in it. I felt calmer and more focused afterward. Pizza looks great too! Thanks Kellie. I’m great now and I don’t think I have ever reached that level of tension since! All bread making is therapeutic to me Kellie. 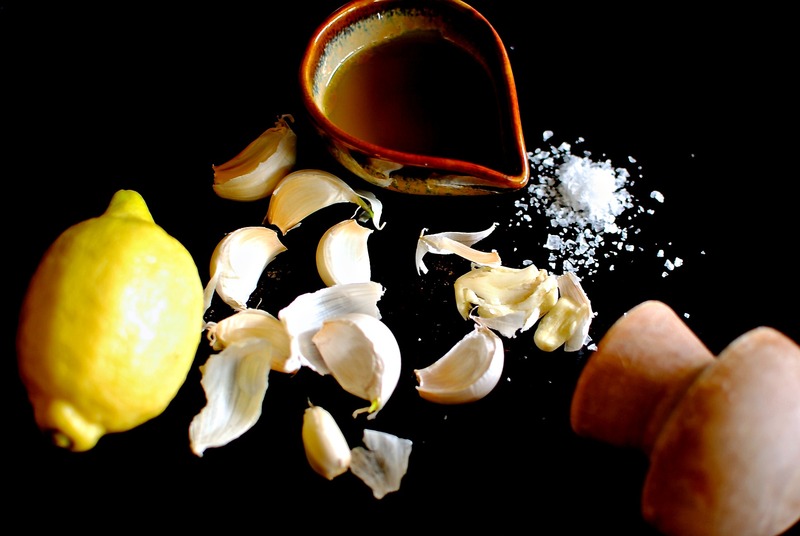 My Polish grandma lived to a ripe old age and ate a clove of raw garlic a day – she passed on her love of it to me….so that sauce is heaven. So yummy, Now I will have to start growing my own mushrooms. Ha ha! Nice to have the option!! Ah Kellie I am with you on the Pharma rage. What a great recipe to soothe you from it. Zaatar of course makes most savoury things taste wonderful. I also like the lemony garlic sauce. a super comfort dish. Yes, I imagine you have a unique view/experience of Big Pharma. I also have at least a tangential link via my Dad’s previous work as a pharmacologist and toxicologist, where work/discoveries go up for patenting. He hates that bit (he’s an old hippy), but it is a part of life in research universities. 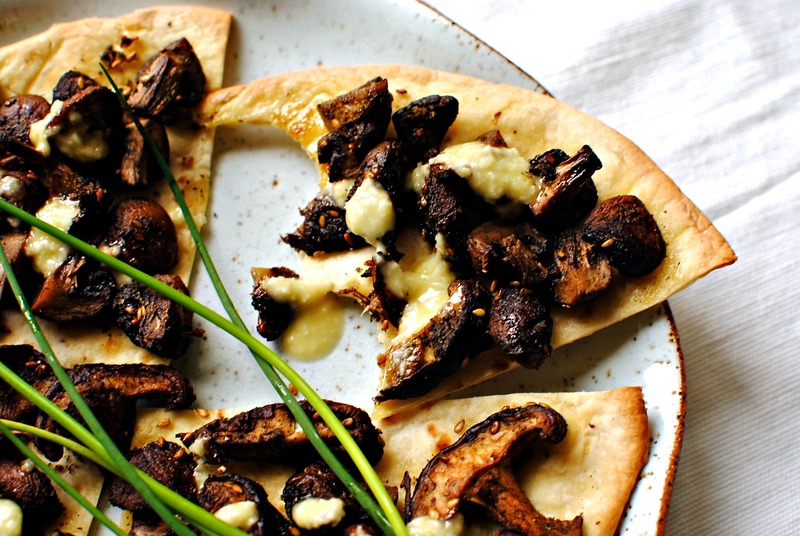 I am not a mushroom girl, but pizza, garlic, olive oil, yes please! When I eat my feelings (or cook my feelings, as it were) they usually end up looking something like this. I’d eat nothing but pizza till the end of the world if I could! Also, I love love love the accessories you’ve got going on in this post! That plate! That sauce bowl! That spoon! Love! I believe I had my meltdown on the weekend (just one in a whole year of juggling full time thesis with full time school, not so bad, right?) so this week has been calm. I’m in good shape to submit ahead of deadline. A single meltdown just proves your human! I have an inkling of how how relieved, happy and proud you will be by week’s end. How are you celebrating?? Well I’ve still got to defend it next week! The husband and I will be celebrating with a bottle of wine we’ve had laying down for 6 years, and then I’ll be nipping over to London for a Champagne filled weekend with my sister. I wrote and deleted a comment to you about three times and then thought, you know what I’m just gonna say it how it is. Last week I got some good news and I floated in the kitchen in relief and pride and made use of colour and crispness and fried stuff. When I am happy, I let go and then think about how I should nurture myself, because I am important. Red oxtail, green peas…you know all that. Today was full of emails that told me all that I didn’t want to hear and actually I thought, maybe they have a point. Bitter, but maybe it’s time to move on? So, disenchanted with it all I thumped out some chappati (so I’m with you on the bread thing) and made a very humble, unglamrous, definitely not fusion meal of okra curry and simple dhal. Basic. Does the job. Unfussy. Just is. Isn’t it wonderful and incredible that we have a sense of each other and the joys and tribulations without having face to face contact? Can I thank you enough for all your kind words and those generous adjectives? I think I need to let go. Least for now. How wonderful it is to see so many people that find cooking and kitchening therapeutic. It is extremely meditative for me as well and I wish more Americans would get in their kitchens more often. Perhaps we would be a healthier country! 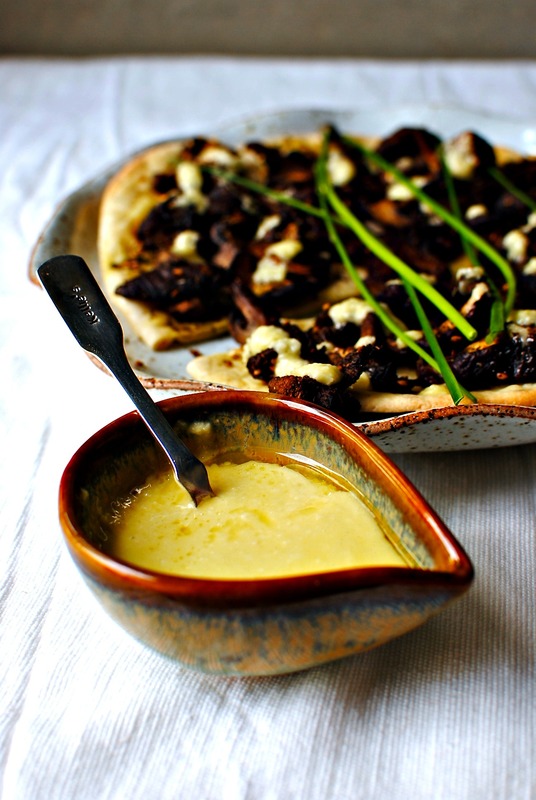 Anyway, mushrooms are a favorite over here and that garlic lemony sauce looks to die for. Never had za’atar spice – thanks for the inspiration! Well, most Western countries are similar to the US in that the population doesn’t feel they have the time or knowledge to do real cooking. I find it bizarre that some food products will declare that once you have stirred together a few packets that you are serving a home cooked meal to your family. I do think that some people really have no idea what the difference is, and it is not their fault. I best not go on that rant though! If you like the sound of the za’atar spice, do look at my recipe – it is embedded deep into one of my early ones. Or, some place like William Sonoma will do you a ridiculously expensive but delicious pot. If you have the ingredients already it is the easiest thing in the world to make up and keep in the spice cupboard. I use za’atar throughout the week to liven things up without making them spicy. I think we may have found you a new best food friend! Let me know when you make it and how you like it/use it. Those potatoes sound heavenly – Dutch Creams. Sounds like a naughty cookie! No guilt. Only so if no one will kiss you afterwards! This is absolutely beautiful! SO glad I came upon your blog! 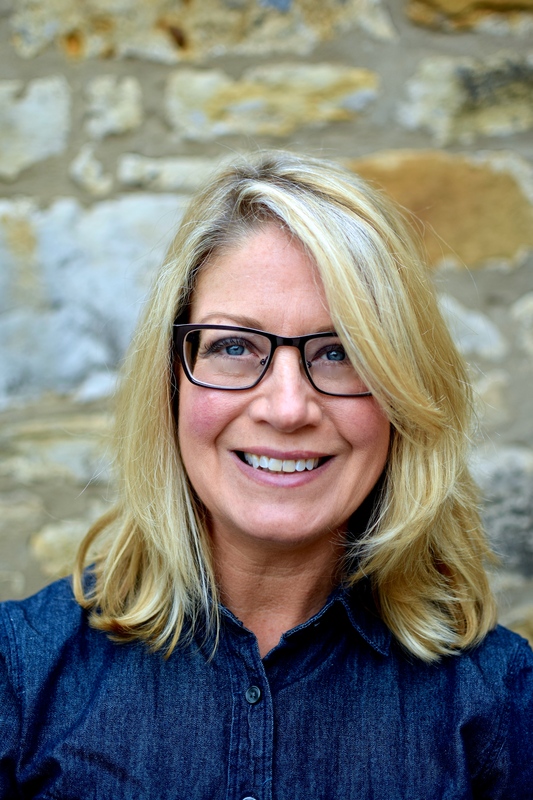 Your pictures are gorgeous and I love the healthy lifestyle that you live…we have the same goals in our blogs and you have so many fabulous ideas! I will definitely be looking forward to your posts! Thanks! Thanks for stopping by Hagen. I’m glad you found me and took the time to say hi. Really lovely. I’m a big mushroom fan so this is a winner. Looks superb. I would have to say that BBQing is actually quite therapeutic for me. You get to be outside enjoying the day and hanging out (hopefully with some friends). Your pizza looks delicious! I will definitely have to try that garlic sauce. YUM!